Okay, let's start. I have been using a few foot peel masks in the past year or two. My favourite is the Tonymoly Shiny Foot Super Peeling Liquid that I bought as one of my first Korean skincare/body care products. I was very impressed with the result! It took off so much of this big callus that I had on my left foot. I love its result but hate its cost. Especially with the declining Canadian dollar, they cost about $11 CAD per use. That's a little expensive even for a item that I use maybe twice or thrice a year. I am also not fond of its strong chemical smell that would linger in my mouth, even though it's actually soaking my feet. The other foot peeling mask I tried was the Mizon Magic Peeling Foot mask that I received from Memebox. You can see the review here. RoseRoseshop doesn't seem to carry it anymore so I am assuming it is probably discontinued. It's a good thing too, as I found it did nothing to my feet besides making it super dry. 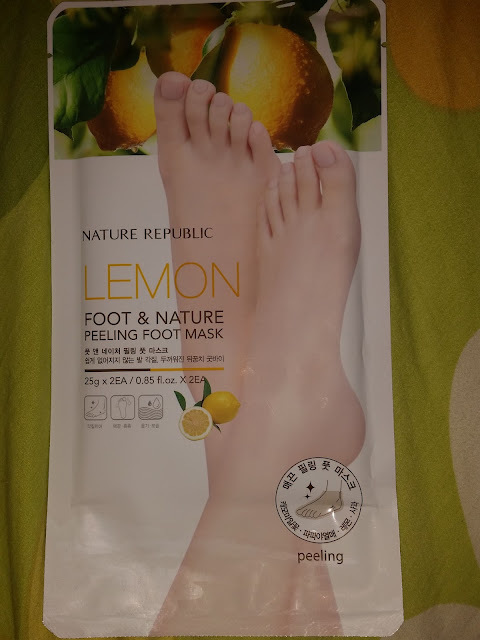 I heard good reviews for Nature Republic Lemon Foot & Nature Peeling Foot Mask and it was about $3.50 USD so I decided to buy it to make up the weight for one of my hauls. Sadly it looks like Nature Republic has discontinued the product. 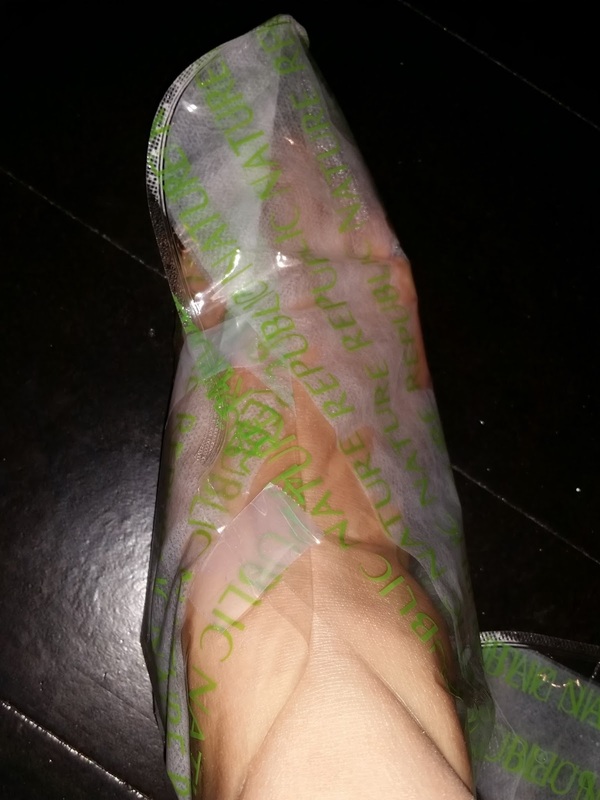 They now have a new version of peeling foot mask with aloe vera instead. Hmm, I am surprised to see so much fruit extract in a foot mask! Though I don't like seeing alcohol listed as the first ingredients. Oh well, at least it's not going on my face. The masks comes in two sealed booties that has a plastic shell, mesh lining and liquid solution. My advice for this pair of booties is to cut well below the "cut line". 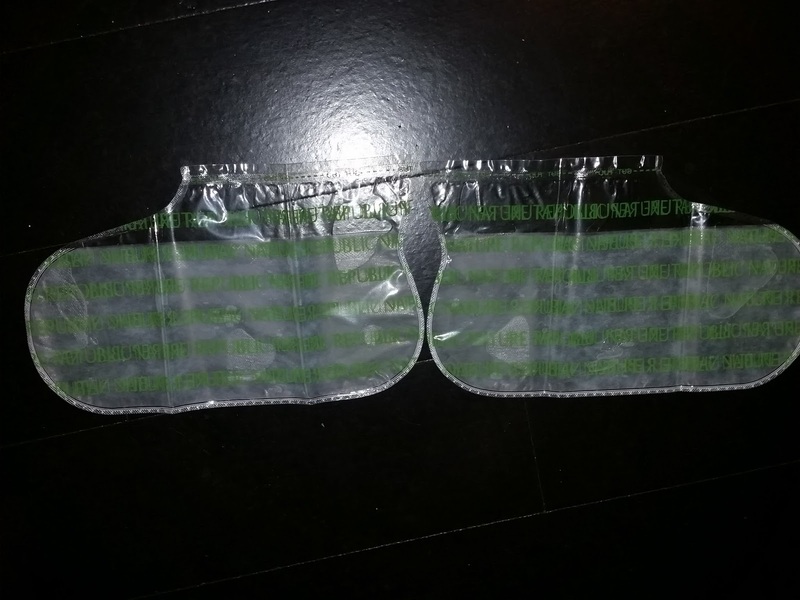 I cut right on the line and I could not open it at all. Had to cut further down to open it. As mentioned above, each bootie has the liquid solution inside. The liquid has a chemical smell to it, most likely due to the alcohol. Though it isn't as strong the Tonymoly version. The bootie is not that big. As you can see above, my size 6 foot is just comfy in it. I can't imagine it being able to fit someone with a shoe size over 8. My problem with these booties is that there was no tape to close it shut! Because there is quite a bit of free flowing liquid in the booties, I prefer to have it taped shut to prevent possible spillage. I wasn't smart enough to foresee this problem and had to roam around with the booties on while trying to find tape. Couple of advice for wearing these booties. 1) After taping up your booties, wear a pair of socks over them. Preferably a pair of socks you don't normally wear, I'll explain why at the end. This allows you to move around without fearing any step will break open the tape and your foot will slip out of the bootie. 2) Remove your nail polish before doing this. I learned it the hard way. I had this really nice black base + silver glitter top going in, it came out looking like the mold I found in my Julep eyeliner. So unless you want your manicure to be ruined, do it afterwards! The instructions said to leave it on for 60 - 90 minutes but I tend to leave it on for close to 2 hours to let it really soak. After 90 minutes my feet started to feel warm. So I decided to take it off after an hour and 40 minutes as it was starting to get really uncomfortable. When I took off the booties, my feet were RED. Probably from a combination of the solution and the fact that it was enclosed in a bag for over an hour. My feet smelled like menthol as I was rinsing off the solution, which makes sense since menthol is listed in the ingredients. Which also explains why my feet felt cool as well. After I finished rinsing it off, my feel smelled BAD. It is this unpleasant fermented smell that is so strong that I can smell it while sitting in a chair. I did put on foot cream and socks on after I dried off my feet, but now I wonder if that was the wrong move. Okay.. So gross feet pictures are coming!! Press "End" on your keyboard and read the final thoughts now!!!! Enough spacing, now for the ugly feet pictures! Left foot on top, and right foot on bottom. My feet are super dry as I prefer walking around my place bare feet and always forget to put some cream on them. For some reason my left foot is much more drier than the right foot. There's that thick callus below the pinkie toe. 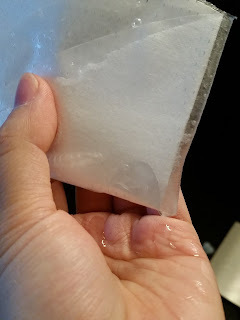 I managed to get rid a bit of it with Tonymoly's foot peel. I am truly sorry for these GROSS pictures of my feet, but you have been warned!!! This is 6 days after I used the foot peel. As you can see, only a little bit has peeled under my right toes, there wasn't much action going on on my left foot. *Sorry about the dirty feet, but I washed my feet prior to taking the photos but they just wouldn't come off. May have been due to the skin being so dry? The pictures are a little deceptive as there were a bit of skin coming off in patches throughout the week. 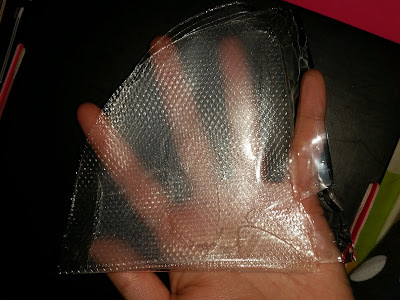 The packaging does say DO NOT TRY TO PEEL OFF THE SKIN! But I am a rebel and I do it anyways. The chunks that come off are very little, they are nothing compared to the big patches I get from Tonymoly. After a bit over a week, this is how my feet looks like. They are much softer than before but you can still see some dry patches on my feet. The mask didn't take off much dead skin from the heels and not much was done to the callus. Most of the dead skin comes from the ball and the sole of my feet. Well, I can't say I am too disappointed with the product. It did what it is supposed to do. Not as great of a result as I was looking for but it cost less than $5 so you get what you paid for I guess. I got another pair that I am planning to use in spring time, just before sandal season. But I don't think I'll buy it again. I think I would rather spend the money and get the good ol' Tonymoly Shiny Foot masks. 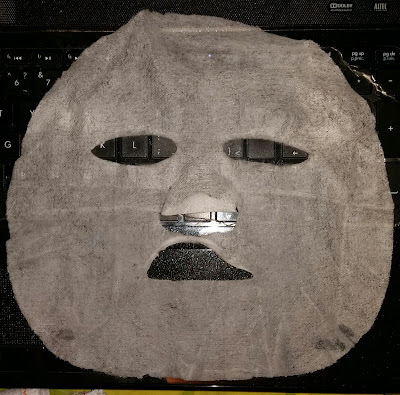 Now a little caution to using socks with these peeling masks. Two weeks ago, I noticed my feet were really dry but chalked it up to the dry weather. But when I actually looked at my feet, I realized it wasn't due to the dry weather at all. The ball of my feet had patches of skin ready to fall off, and the heel was just a big giant patch of dry skin, ready to come off in little chunks. It definitely looked like it was day 5 or something of a foot peel. But I haven't done a foot peel for over a month. Then I realized, I must have accidentally worn the socks I used to secure the booties. The most likely scenario is that the solution leaked from the bootie and I did not realize my socks are soaked in the solution and essentially soaked my feet in the solution again. Yuck I know, but no harm was done to my feet. 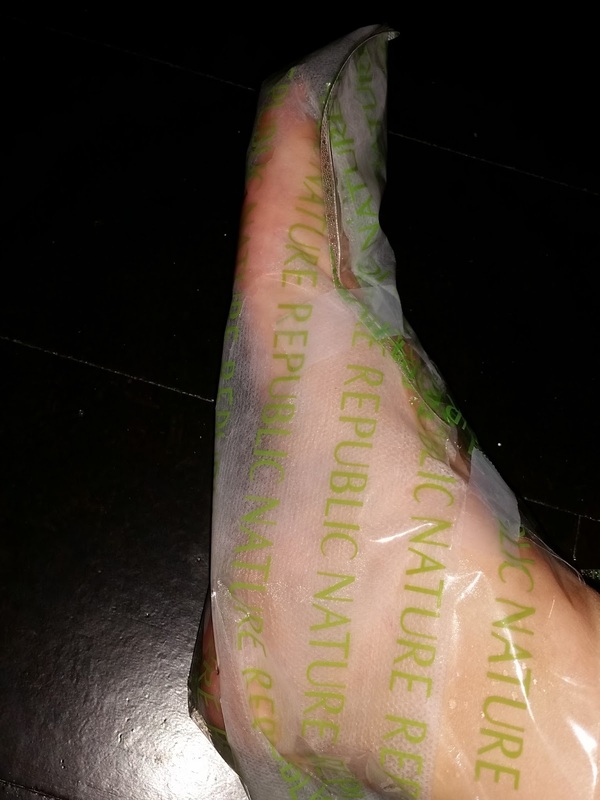 Hope you enjoyed reading my review on the Nature Republic lemon foot peel, even with the gross pictures! 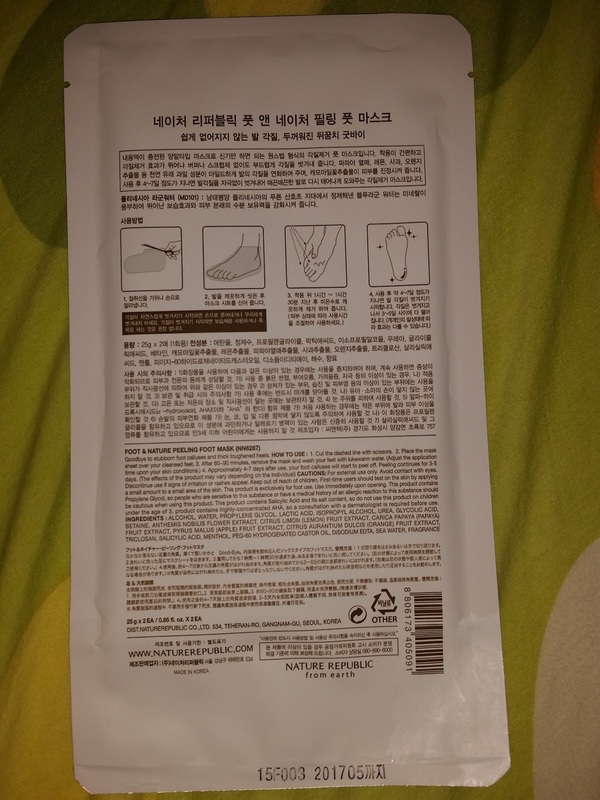 Do you have any recommendations for a good foot peeling mask that is cheap but comparable with the Tonymoly Shiny Feet masks? Just a little background into my skin. It's normal combination, with mostly hormonal breakouts. Though if I don't drink enough water or not eat properly, I will get a little bit of a breakouts too. 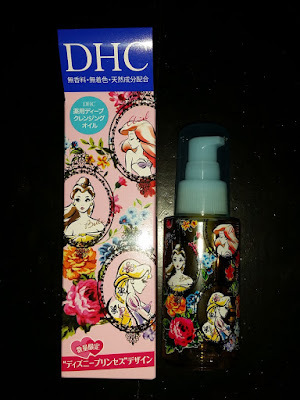 I bought my DHC cleansing oil from BonjouHK for $11.47 USD + shipping. I heard much raves about the cleansing oil and decided to give it a try. I was pretty surprised to receive such a small bottle for $11.47. But that's my fault for not reading properly and seeing it's only 70ml. This is the travel size, not the full size. 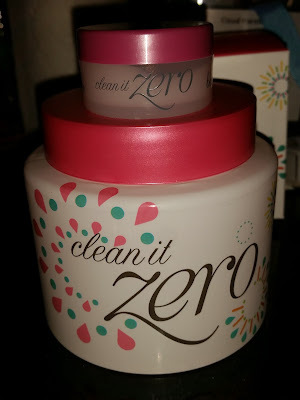 As for the Banila Co Clean It Zero. I bought samples of it on a whim from RoseRoseShop last year and have been using it on and off for a while to clean off make up and sunscreen. I decided to take the full plunge when I saw the jumbo size on sale at Interpark for around $18 USD with free shipping. Sadly, they no longer offer the sale. I received them around the same time and thought, I wonder which one is better for my skin. 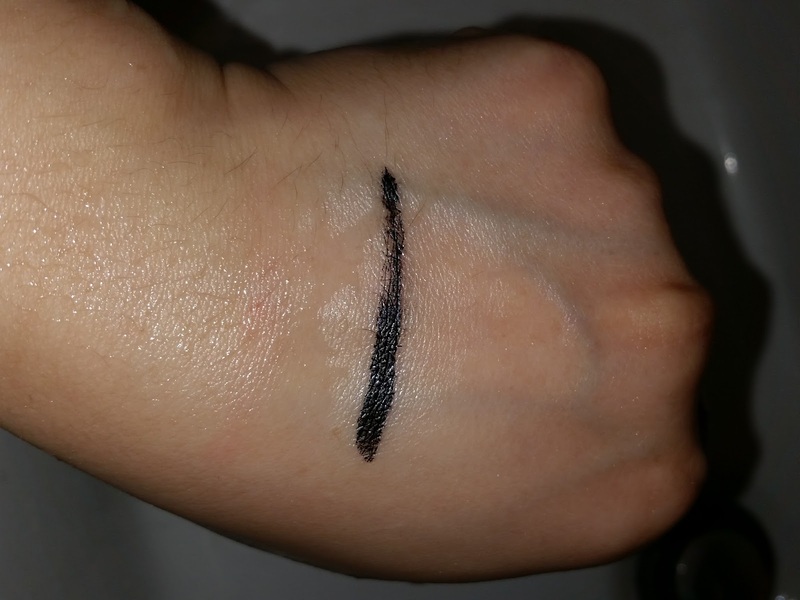 I first attempted it with the removal of make up swatches. Then I decided to split my face down the middle (figuratively of course), with the left side being DHC and the right side being Banila. I tested both at the same time as I have already been using Banila before, so technically I am only introducing one new item into my routine. First thing I did was, of course, make up swatches and see how both did in removing them. 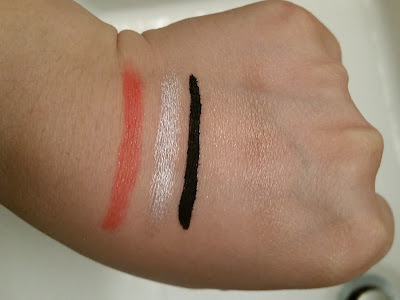 I grabbed whatever I have and swatched it. 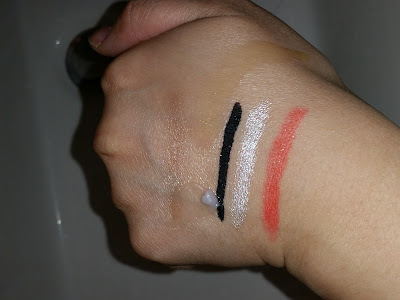 From left to right they are, lip stain, random white cream eye shadow stick I bought off of eBay a long time ago(I use it on the bottom waterline), Heroine Make Eyeliner, and Quo glittery eyeshadow. I put the DHC on the top/closer to my thumb and a small dab of the Banila on the bottom. In the results, the position of the two switches as DHC is a liquid and it was impossible to take a picture of it without having it drip off of my hand. The top is Banila, which you can see is causing a bit of muck when it's rubbed in. The bottom is DHC and it's looking kind of like nothing is happening. This is after I rubbed at my the back of my hand for a good minute and rinsed everything off with water. It looks like everything besides the eyeliner and the lip stain has been washed off completely. If you look closely, the lip stain is still visible, just a tad fainter on top than the bottom. Similarly, the eyeliner is less prominent on top compared to the bottom. That eyeliner was so stubborn, I regretted putting on such a thick line. I had to walk around with that on the back of my hand for a few days as nothing could remove it completely in one go. That tells me that Clean It Zero is just SLIGHTLY better at removing make up than DHC. In the make up removing power, Banila Co barely beat DHC. Okay, now to my long comparison chart. Herbal smell, most likely due to the rosemary leaf. Every time I use it, I can only smell it at first then I can no longer smell it. 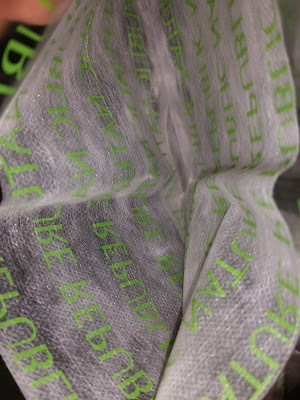 Soft when fresh out of the container, and melt into oil upon contact with skin & body heat. Half a pump covers half of my face. 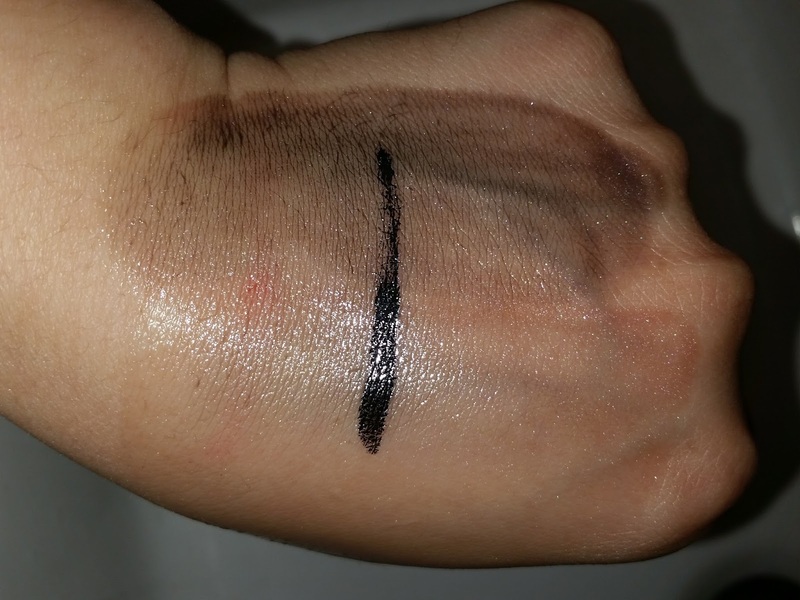 Pumped onto fingers or palm of hand and quick apply on face. Pea size scoop is more than enough for half of my face. Usually extend to the neck area if there are any extra. As it is oil, it can drip if I don’t apply fast enough. Transfer from provided spoon onto fingers, then onto face. Some chunks can get stuck between fingers and have to stop and move those chunks onto face and continue massage. Slightly unsanitary due to the spoon. Upon contact with water, feel like all of it rinsed right off. It felt like skin contacting skin, without the oil in between. Upon contact with water, feel like there is still quite a thick layer of oil on my skin. Keep on massaging to rinse off. Still feel like there is some left on skin. Caused some mini breakouts around the chin. Continuous usage lead to more breakouts on forehead and cheek compared to DHC. **I used TesterKorea for a standard price point comparison. The two are available on different sites and different mark ups. TK is the only site that I can think of that has both and uses the same mark up. Price point and ingredients wise, Banila wins over DHC. It cost nearly half as much and have less triggering ingredients. Banila won over DHC in all the categories I can compare. But honestly, my final thoughts on both are kind of meh. As for Banila Co, it is much cheaper for less triggering ingredients list and slightly better make up removal performance. However, I can't get over how it feels like I have not removed all of it, despite double cleansing. I now have deep regret over ordering the jumbo size and is left pondering how am I going to use it all up before it expires. .·´¯`(>▂<)´¯`·. Oh, not to mention how the Banila side of my face had more breakouts than the DHC's side. That is also a big no no. Well, this is my thoughts on the two popular cleansing oil/balm. Hopefully that can kind of help somebody out there. This mask.. *swoons* I am SO tempted to buy more.. ヽ(*≧ω≦)ﾉ Maybe.. Just ONE more box??? It usually is around $30 per box but Interpark has it for sale at $14 including shipping. Due to our crappy Canadian dollar, it works out to be closer to $20/box. Still a saving of $10!!!! I should buy another box.. Shouldn't I???? Okay, backing away from the craziness for now and back to the mask itself. 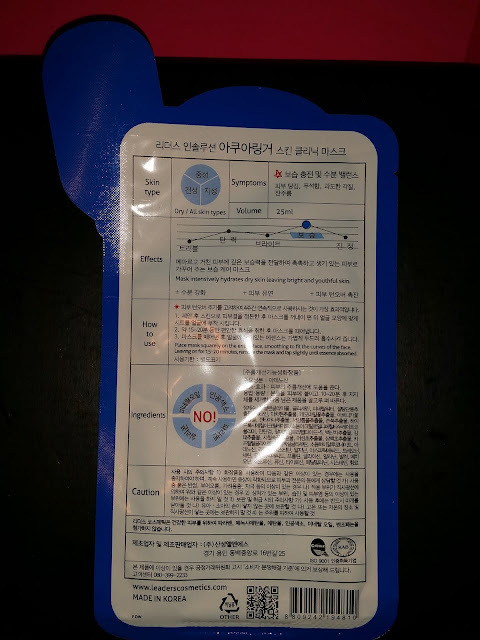 Ingredients: Sorry it's all in Korean. No translation right now. The mask is soaked in a clear, runny syrup like essence that has a very strong fragrance. It's floral, sweet, and kind of shampoo like. I would say it smells similar to The Body Shop's Moringa line. The smell does occasionally waft into my nose, but it isn't strong enough to give me a headache. Those who are sensitive to smell, you may want to avoid it or try one mask before investing in a whole box. There was a bit of an optical illusion with the essence. It looked like there was quite a bit of essence left in the package so I tipped it over to pour it out. I got.. Nothing.. So I stuck my entire hand in there and managed to scoop some out. Guess all that syrupy essence just grabbed onto the mask. My biggest surprise for this mask was the fit.. This was my note to self while putting on the mask "fit is AMAZING". I kid you not, I actually put down all caps in my notes as my first impression. It fits my face like a glove. Like the much adored LoveMore (not by me but many others) and My Scheming silk masks. It hugs my skin so closely that even with flash, I had trouble telling I had a mask on. The only way I can tell is the little folds around the jaw line. 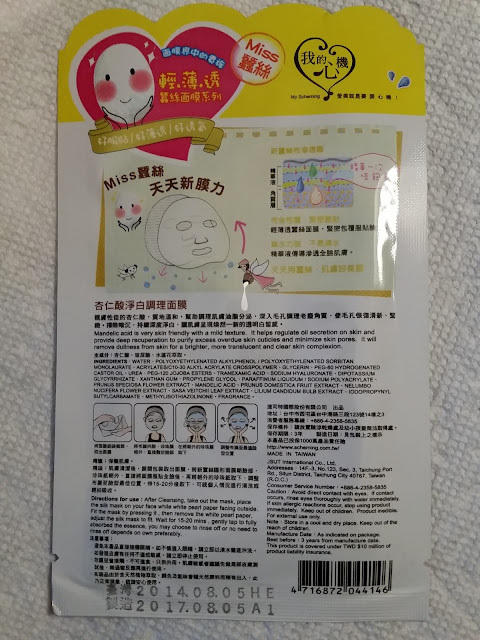 This mask goes all the way up to my hair line and the nose flap covers my little piggy nose perfectly. Down side is that it's similar to most masks, where it doesn't reach all the way to my ears on my chubby face. T__T You can see clearly there's quite a bit of space between where the mask ends and where my ears are. 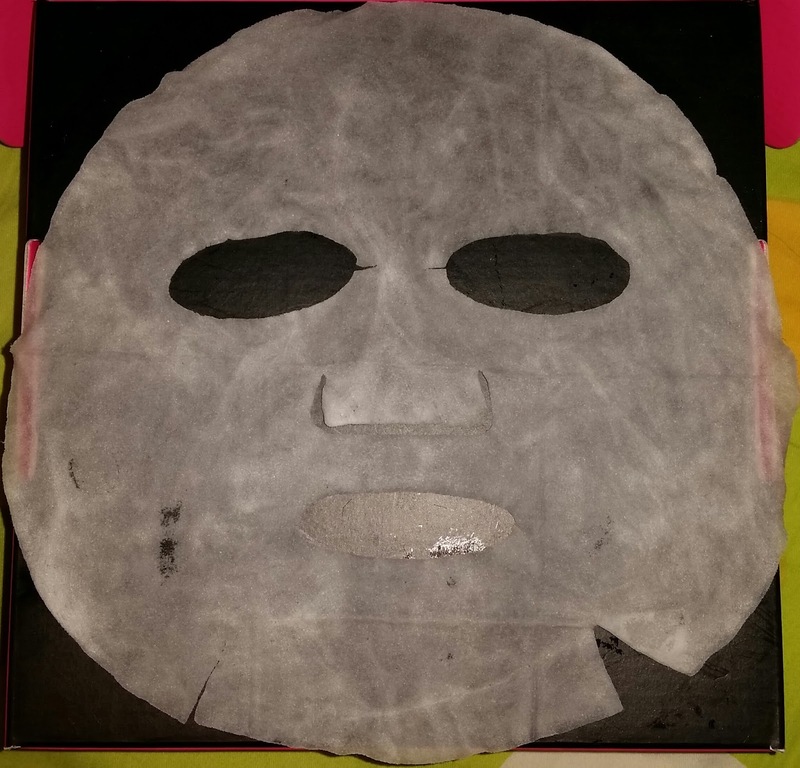 I had the mask on, without a cover, for 30 minutes before the semi-translucent mask started to turn opaque. The leftover essence made my skin feel sticky to the touch. For some reason that night, I decided that was the end of my routine. I don't need anything else. So I basically had toner, Cosrx Blackhead Power liquid and mask and went to bed. NOTHING ELSE. Yup, I was so smart that night. But then again, it was still pretty warm out so it wasn't pertinent to use too much products. This was one of the masks in the Brightening and Clarifying Mask book I purchased from Beautius. 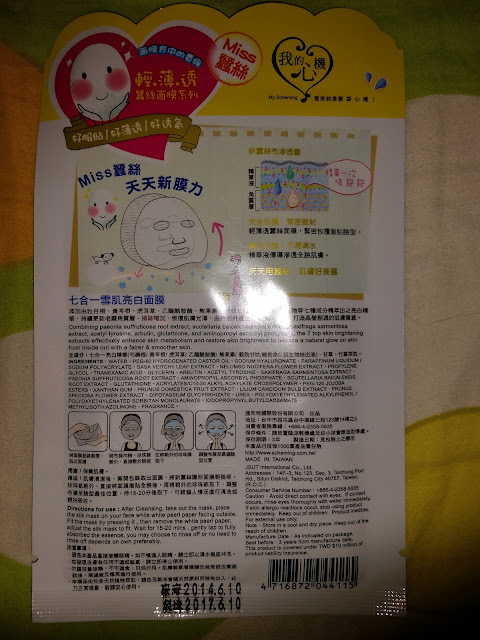 They suggested using the brightening masks in the mask book for three days in a row before trying the Donkey Milk mask. Sadly I kind of stopped after the second brightening mask. No reason other than I got too tired on the third night and just went straight to bed instead. These are silk masks, just like the LoveMore masks. I mentioned it before and will mention it again. They cost half the price of the LoveMore masks. If you look on BGO, the Taiwanese price for the My Scheming Mask and LoveMore is both $299 NTD/~$12 CAD per box. Except My Scheming offers 10 per box instead of 5 per box. They are more readily available through e-tailers than LoveMore, though LoveMore has gained more traction online. For Canadians who has a T&T in their city, My Scheming is more accessible as I believe T&T is still carrying them and often have sales. The price per box is usually around $13.99 CAD, which works out to be cheaper than online as our Canadian Dollar is doing so bad right now. So I recommend checking out your local T&T before placing an order online. Okay, little rant about pricing over, back to the mask. True to a silk mask, it hugs my skin very well. There are some folds, as you can see above, but they are primarily due to the fact that there was no slit along the jawline. I am loving the fact that it's a little bit oval and longer on the sides, just so it can reach my ears!!! I always appreciate that little extra bit of mask. I had the mask on uncovered for 30 minutes before taking it off. My little problem with this mask is that it dries inconsistently. The upper lip area dries out the fastest, which I kind of understand as it's the smallest piece. But my left eyebrow dried out faster than the rest of my face... So weird, just the left eye brow area. Anyways, results wise, I noticed my cheeks are less red and my skin tone is evened out. My skin looks brighter to me, but I am not too sure.. ԅ[ •́ ﹏ •̀ ]و Using brightening products on a pale skin makes it hard to tell the results. Another silk mask from the Mask Book. As you can tell from the packaging, Mandelic acid is derived from almonds. According to Wikipedia, it is often used as a component of a chemical exfoliants. This is after being squeezed while in the package, it's still dripping on me. 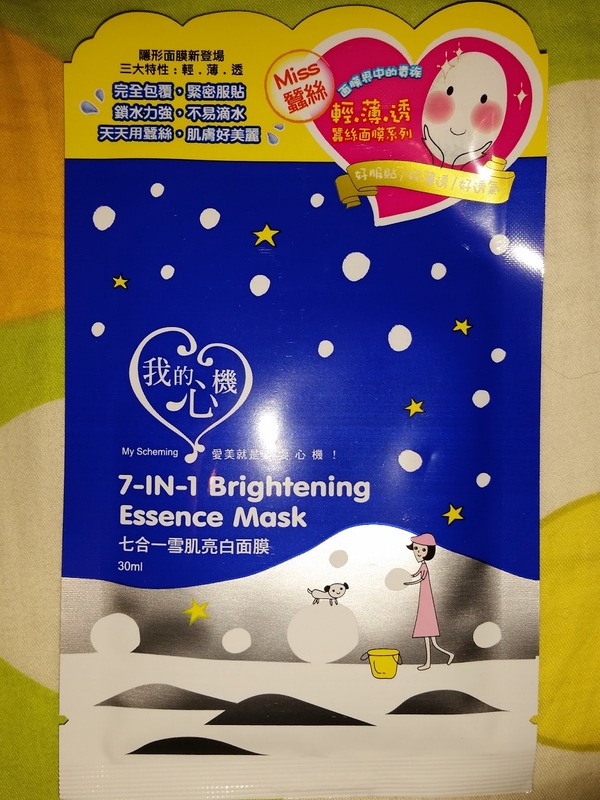 The mask is very similar to the 7-in-1 Brightening Mask above. The mask was dripping wet despite being squeezed before taken out. It has a very sweet note to it, but also a chemical base note. I am assuming it is partially due to the fact that they are from almonds? Artificial almond flavouring often has a sweet almond flavour that leaves a chemical aftertaste. Similar to the 7-in-1 Brightening mask, it hugs my skin so well that it looks like I am wearing nothing at all on my face. I did end up taking it off after 35 minutes due to the same reason. It started to get really dry in certain areas of my face. My face appeared to be brighter, though like I said above, sometimes it's hard to tell due to my pale skin. (Yes I am bragging ✧٩(ˊωˋ*)و✧) But I know it calmed down the flush on my cheeks. My only complaint is that it's not moisturizing enough despite having Sodium Hyaluronate. But I am just picky, this is a brightening mask, not a moisturizing mask. I decided to give LoveMore silk masks another try before I write it off completely. Considering how I already tried out two brightening masks for this post, I thought why not try the whitening one frrom LoveMore. I am so happy to see pearl as first ingredient on the list! Though I do wonder if Taiwan have the same ingredients listing rules as Canada. So for now, I will assume they use a similar listing rule as us. Even if it's just to fool my self for a bit. I do like the ingredients list. 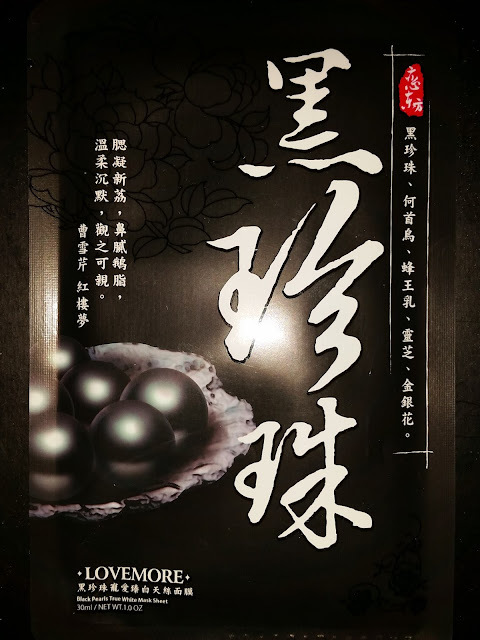 Pearl, honeysuckle, ganoderma, royal jelly, polygonum multiflorum, and hyaluronic acid. A couple of those ingredients are probably foreign to those who aren't Asian. But Ganoderma and Polygonum multiflorum are viewed as having anti-aging properties in Chinese culture. So in addition to brightening, the ingredients is supposed to provide anti-aging properties. 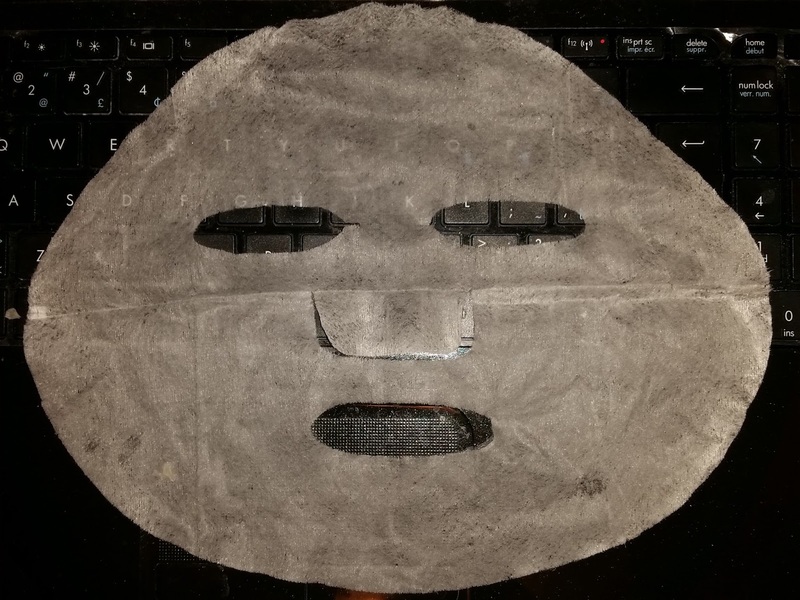 The mask was sitting in clear essence that have no prominent smell to it. If I sniff really hard, it has a kind of a chemical note to it. As with the other LoveMore masks, there was a bit extra mask on my forehead, little small around the mouth area (as you can see with the curled upper lip area above), and a little long on the nose (hence the flipped nose piece). Other than that, it hugged my face very well, and it does extend pretty close to my ears. I was introduced to this mask by Fanserviced. She had a review of it on her Instagram and I just had to get it!!! 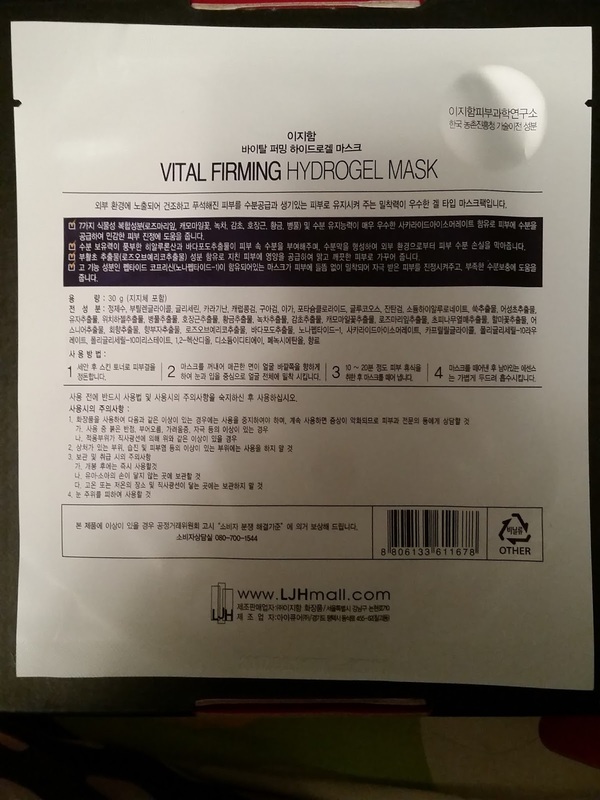 I ordered it from HKC Plaza for $4/mask including shipping. Unfortunately due to stupid Canada Post, I didn't receive it until a month and a half later. So after all that waiting, I just HAD to try it on rightaway!!! 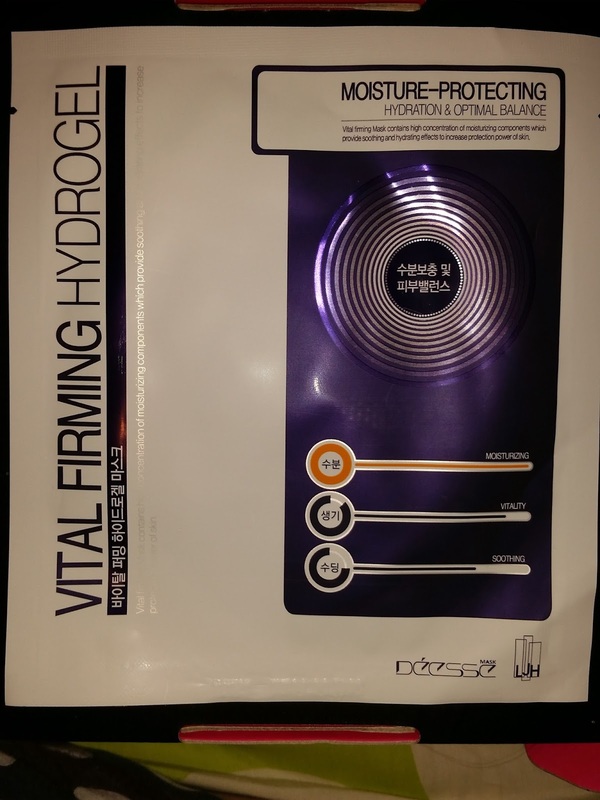 The hydrogel has a very sweet smell to it, kind of like lychee. Unfortunately, it did turn into a chemical/stale cigarette smell right afterwards. Thankfully it's faint enough that I can disregard it after a few minutes. Typical of hydrogel masks, this mask comes in two pieces. It is one of the thinnest hydrogels I tried so far. It doesn't have mesh to hold it together. 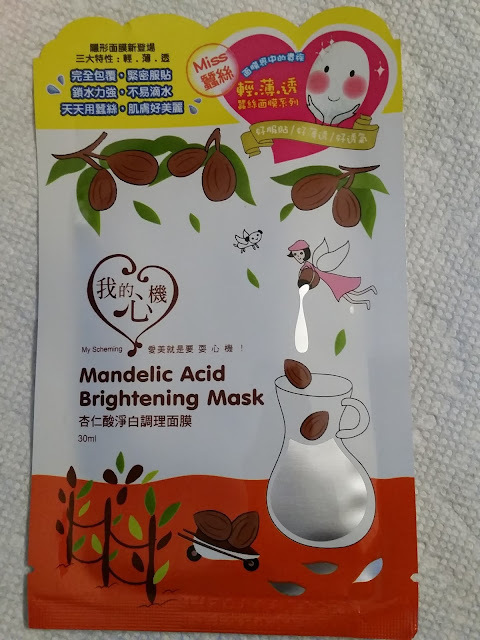 It's similar to the Foodaholic Pearl Shining Hydrogel mask where it's just two pieces of gelatinous essence, but much less delicate. I separated the two pieces first by removing them from the smooth of pearl paper, and then I removed the texturized pearl paper. I think the proper way is to remove the texturized pearl paper first, then remove the mask from the smooth piece of pearl paper. Sorry for using texturized SO freaking much but I don't know what to call that pattern. Waffle cone? Honeycomb? 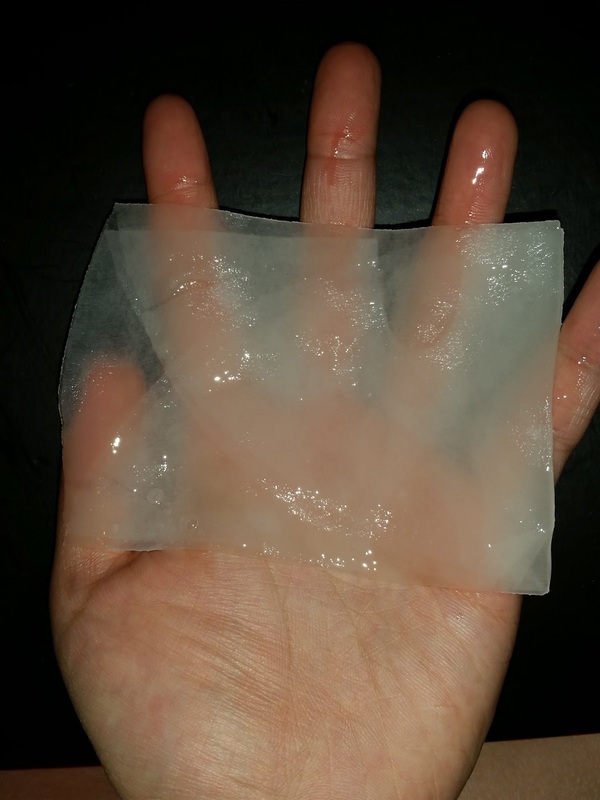 The hydrogel felt thin and delicate to the touch but I find that I can easily adjust it without causing any tears. It fits my face quite well. There was a bit of tenting around the jawline so I feel like a slit there would be beneficial. Though because it's a hydrogel, it is bound to be less flexible than a regular sheet mask. My other complaint would be that the mouth hole is too big. It extended well past the corner of my mouth. So I kind of feel like I got the outline of a clown's mouth on my face. Even though it stayed on my face very well, I chose to use the Daiso silicone mask cover. Not for the movements but for any evaporation of the precious essence. This is a $4 mask (close to $5 in CAD), so I want to make sure all that darn essence goes into my face and not into the air. I accidentally left it on with the mask cover for 70 minutes as I must have been busy playing some kind of game. The exposed area, aka the upper lip and nose area, was dried up by then. 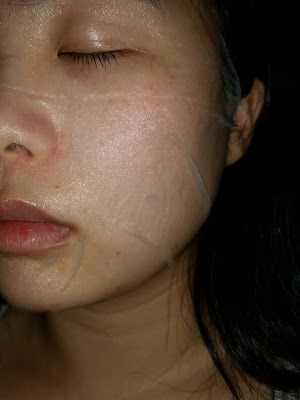 So I simply shifted those areas so they no longer touch my skin and continued with my masking for another 15 minutes. After which, the mask started to feel thinner so I removed it. There was no extra essence left on my skin to be patted in. Though my face felt very smooth and soft to the touch. I was ready to love this and cry for my poor wallet. But alas, a day later, my skin started to show signs of rebellion. ｡ﾟ(*´□`)ﾟ｡I started to break out, and I haven't introduced anything new since I tried the mask. 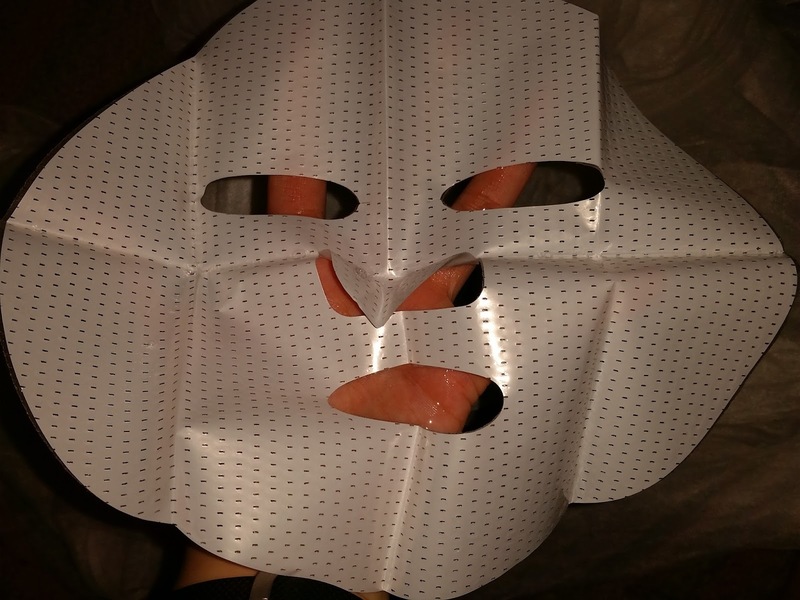 So unfortunately, the mask was just too much for my skin. 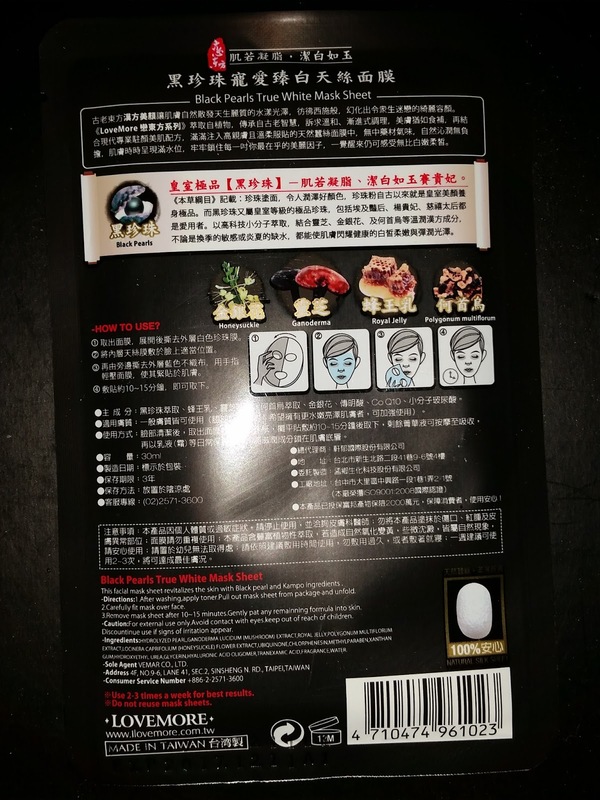 I need to spend time translating the ingredients and see what is causing my skin to react from it. Overall, I definitely will try to stock up on the Leaders Aquaringer mask if I can.. I just can't right now due to being on a no-buy. I would restock on My Scheming silk masks, but probably not the brightening ones as I don't think I need it. As for LoveMore, I will keep trying all the flavours I got but most likely won't pick it up again. The LJH I had high hopes for, I really enjoyed it but won't pick it up since it is pretty expensive and caused a reaction with my skin.